Please review our list of Acorn Training Guides below. If you are unable to locate the tutorials you need in this list, you may E-mail us at support@acorn-is.com, or call us at 719-329-0977, and choose Option 1. Below is a list of 9 tutorials that every Innkeeper or Property Manager should take time to read. Each of these Tutorials will help you understand the basics of what a Search Engine is, basic Design Guidelines that should be followed for any Website, the difference between an Organic, Local (Google My Business) and PPC listing. Finally you will learn what it means to be “SEO Friendly”, what Website Popularity is, all about tracking software and what items you should be tracking. In addition to providing attractive Web design and reliable hosting services, Acorn Internet Services specializes in effective, affordable Web site promotion. Included below is a list of Website Design Do’s and Don’ts Guidelines. It’s very important to make sure your Web developer understands what the search engines do and do not like. If you do not build your Web site to follow Google’s various guidelines and be search engine friendly, you will be missing out on the FREE Organic / Natural traffic you could have. Remember, it is this type of traffic that does NOT COST per click. You can get a robust list of Google Recommendations at Google’s Webmaster Guidelines web page. Do have a pleasing, easy to read, easy to navigate, fast loading, informative (words and images) Web site that is tested on all current browsers. Do include best Meta and Descriptions Tags with supporting text on EVERY page of your Web site. Do use a search phrase look-up tool such as Keyword Discovery or Google to determine what people are typing. Do work to increase appropriate link popularity. Do work to get accurate citations where your NAP + W (Name, Address, Phone + Website), is spelled exactly the same everywhere online. Do add ALT Tags to your images – but don’t use images in place of text. Search engines can’t “read” an image (other than the alt tag) but they do read real text. Do have Search Engine Friendly navigation including both a HTML and XML site map. Do have at least 150 words of well-written, natural sounding, text on each page you plan to market. Make sure your NAP + W appears in the Rich Snippet / Schema Testing Tool for every page of the site. Do submit to any and all free listings and directories that support your business type. Do sign up with all the online directories that best support your business. Do sign up for PPC (Pay Per Click) with Google, Microsoft adCenter, Facebook, etc. if you aren’t getting the business you need. Don’t use FLASH on your Web site – Google can’t read FLASH, and many mobile devices won’t display FLASH. Don’t have a “framed” site – Search Engines have difficulties crawling a framed site. Don’t participate in Link Farms. Don’t over “stuff” your keywords in your text, titles or descriptions. Don’t copy content from other sites online or have “duplicate content” on your site. Don’t use hidden, off page or slightly off-color text to fool the search engines. Don’t search engine market more than 1 URL to your Web site. Don’t provide more than 100 links on any one page. Don’t have a splash entry page. To understand search engine optimization, marketing, and ranking, you first need to know what a search engine is. A search engine is a program that searches documents stored on the World Wide Web for specified keywords and returns a list of the documents where the keywords were found. The term “search engine” is often used to specifically describe systems like Google and Yahoo that enable users to search for documents on the World Wide Web. Typically, a search engine works by sending out a spider to fetch (or crawl) as many documents as possible. Another program, called an indexer, then reads these documents and creates an index based on the words contained in each document. Each search engine uses a proprietary algorithm to create its indices such that, ideally, only meaningful results are returned for each query. There is 1 major and 3 smaller search engines being used in today’s market place. 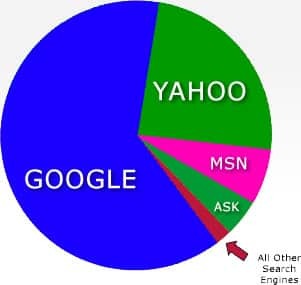 At the top is GOOGLE, then YAHOO!, BING (previously MSN), and ASK. As you can see from the pictorial to the right – you want your Web site to be listed with a high search engine ranking in these search engines – preferably in the organic placement section and not just the PPC (Pay Per Click) sections of the Website listings. These 4 search engines make up approximately 95-97% of the entire Web surfing public. Organic search engine placement is free and is one of the three main types of traffic available to Web surfers to locate information. In addition to organic, or natural listings, there are Local listings and PPC (Pay Per Click) listings. Below, you will learn about all three and how to spot the different listing types in the major search engines. Organic Placement – Organic placement, also known as natural and sometimes FREE placement, is the ability for the search engines to read your Web site (also known as spidering, crawling, or indexing) and based on your Web site metas, content, and domain authority, place your listings in their displays at NO COST. This is not to be confused with PPC (Pay Per Click) placement where a vendor “pays per click” to be seen. PPC doesn’t consider how well written the site is for indexing (i.e. : Is it search engine friendly? ); only that the vendor is willing to pay to be seen. Local Placement – To identify a Local Business Listing, type in the Search box: City + State + topic you are searching. Depending on the search engine you are using, Local Listings appear slightly differently. Google: On the search results page, you will see one of two types of Local results. The first type is denoted with “Lettered Balloons” that when hovered either turn RED (free) or BLUE (paid). Listings with a Balloon indicators are Local Listings. You may also see a 3 Pack Local Stack listing (if you are searching with Bed and Breakfast or Hotel phrases). These Local listings are identified in a box with a light grey border and typically have a photo to the right of the listings. Remember that these listings may differ slightly from Google Maps Listing (www.google.com/maps) but both allow you to access a Detail Page for any Local business. Yahoo: On the search results page, you should see a map and “Numbered” Listings below the map. The numbered listings are the Local Listings. PPC (Pay Per Click) – Pay Per Click Programs are available through companies such as Google Adwords, Microsoft adCenter (Bing Ads) and Facebook. Pay Per Click Programs DO NOT CONSIDER whether or not your Web site has been developed to be search engine friendly. They simply want you to choose phrases that you want your site to appear on, then you pay every time someone clicks on that listing. You will recognize a PPC listing in any of the search engines because it will be in a section denoted ADS. So when you see the group heading ADS, you know that if you click on a listing in that section, the vendor will have their account charged at the point you click. Every PPC system does their placement and cost structures a little differently, but what they all have in common is that when an AD gets clicked on, the vendor pays – Every Time. Finally, you will note that many sites have a Web address and then a / with a file name, and possible sub-directory, appended on the end of the Web address. This is because the various search engine(s) have indexed a sub page of the site – not just the home page. By indexing multiple sub pages, with different meta tags and content, the amount of traffic to those pages increases, thus increasing the overall visitors to the Web site. Any Web site with more than one page can do this to expand visibility on the Web. To learn more about indexing multiple pages of your site in order to drive more traffic, read Online Tutorial SE103. Now that you understand what a search engine is from Online Tutorial SE101, have learned how to read the 4 different search engine layouts, and know the difference between an Organic, Local and a PPC (Pay Per Click) listing from Online Tutorial SE102, the next step is to learn the correct steps for creating a search engine friendly content for your Web site and Blog. Search engine friendliness is the process of creating a Web site that the search engines can read easily and index appropriately. To create a search engine friendly site, you must first learn about meta tags. WHAT ARE META TAGS AND WHERE DO YOU PUT THEM? A meta tag is a special HTML tag that provides information about a Web page. Unlike normal HTML tags, meta tags do not affect how the page is displayed. Instead, they provide information such as who created the page, how often it is updated, what the page is about, and which keywords represent the page’s content. Many search engines use this information when building their indices. Every page of your Web site is an opportunity for you to advertise your business. To make use of this opportunity, you have to tell the search engines about each page. This is accomplished with 3 main meta tags (wording and phrases that are coded into each page of your Web site in the section). HOW DO YOU WRITE A SEARCH ENGINE FRIENDLY META TAG? Meta Title – The Meta Title should be approximately 50-55 characters and should be comprised of Natural Language content YOU KNOW your potential guests are typing and is being discussed in TEXT on that page. Meta Description – The Meta Description should be approximately 120-125 characters long and act as the tag line that entices the potential guest to click on your listing and learn more. The Description should also be written in Natural Language format. Finally, to best support your meta tags, the content on your page should be a minimum of 150 words, including the Natural Language content you are using in your Meta Title and Description. Recommendation: You should create separate and unique metas for each and every page of your Web site. If you do not do this, you will see errors in your Webmaster tools indicating duplicate metas. The search engines will index each page independently and create entrance pages based on your meta tags and content for each of these pages. The more pages you have indexed, the more chances you have of being found for different keyword searches. Once your site has a solid foundation and has been built to be Search Engine Friendly SE103, now the bulk of where your organic listing shows up in the index (are you on page 1 or 2 or not) depends heavily on your Web site’s link popularity. Search Engine Popularity, which helps to determine your Web site’s ranking, comes from how many other QUALITY Web sites link TO your site – – not how many sites you link to FROM your site. The more links you have directing people to your site, the more popular your site becomes. Each Search Engine has its own algorithm to weigh the value of each link. The best way to get a full list of inbound links as counted by Google is to install Google Webmaster Tools. There are online tools such as Open Site Explorer that will give you information regarding the in-bound links TO YOUR WEB SITE. In addition to looking at who is linking to your site, you may want to look at who is linking to those high-placing sites (your competition) and go after those links for yourself. Open Site Explorer allows you to review inbound links to any URL. It’s also a good idea to sign up for quality Directories (those applicable to your business or area) to link to your site. And remember, it’s important to choose only quality sites to link to your site. You want to be careful of link farms. Link farms are sites that simply trade links for the sake of trading. They usually have no rhyme or reason for the data they provide; they are just lists and lists of links. Just as being popular is all about being associated with good quality sites, the wrong links can work against you and cause your popularity to decrease. Just remember, the more (appropriate and quality based) Web sites that link to your Web site, the more popular your site will become. In this section, you will learn what a Web site tracker is and how it can benefit your business by giving you the information you need to make good decisions regarding your Internet marketing dollars. We recommend all Innkeepers and Property Managers have Google Analytics (Free) installed on their Web site and Blog. It is a GOOD IDEA to gather and review your Web site statistics on a monthly basis. This way you can keep track of trends and visitor counts from the previous months and years. If your trends are showing more visitors, that’s a good thing. But if you are losing visitor traffic, it may be time to update your site to the latest technology, review its Search Engine Friendly features or consider a SEPPIR report to identify potential Digital Baggage Issues. Information gleaned from a Web site tracker can help you make smart marketing decisions. First, you want to know how many Unique Visitors are coming to your site each month and what other Web sites are referring customers to your site. Second, if you are paying directories or listing services to advertise for you, you will want to use your referrers’ tracking as a benchmark. If these companies do not send much traffic through to your site, a phone call is in order to find out why. Sometimes these companies have their own statistics. You may find your page on their site is getting much more traffic than those customers who actually click through to your site. With this information, you can decide to keep those directory listings that are working for you or drop those that are not working for you. Third, if you have made your site Search Engine Friendly, then you need to watch the Search Phrases people are using to find your site and use this information to tweak your meta tags and Web site content, if necessary. If a term isn’t working well for driving traffic, change it. If it is, you know your tags and content are doing their job. Finally, if you are serious about taking your Tracking Information to the next level, consider purchasing a Sales / Booking Tracking System, such as Intell-a-Keeper to add on to your Statistics Tracker. You may also choose to configure Google’s e-commerce tracking in addition to the basic Google Analytics installation. Keep in mind that your Booking Engine must support e-commerce tracking for you to effectively use this tool. With a Sales / Booking Tracking System you will know FOR SURE where your bookings are coming from and not just your Web site traffic. Bed and breakfast marketing research provided by tracking tools will help you develop a plan to most effectively market your B&B Web site. Below are the recommended pieces of information you should track on a Monthly Basis. This information should be recorded and kept separately from your tracker. By doing it this way, you will be able to see trends from month to month and year to year that will help you make good marketing decisions about your business. Session Counts, tell you how many potential guests visited your Web site for a specified date range. Some Web site trackers included in these counts are the visits occurring from Web crawlers and spiders that read your site and index them in the various search engines, some do not. You need to know if your unique sessions include the spider traffic, so you know if you are looking at combined numbers (spiders and human) or just human. Remember, you can’t sell a product to a spider or crawler. Included in your Session Count you will see all sessions from all different types of referrers. It’s also good idea to know how many came from any PPC (Pay Per Click) Programs. This will help you see how much search engine traffic you are paying for and how much search engine traffic is free. It is important to track the various companies sending traffic (sessions) to your Web site. We recommend you track at least the top 10 referrers each month, but you may track as many referrers as you deem appropriate. This information should be recorded separately from your tracking system. In most cases, every Paid Listing site will have more traffic to your page on their site than will have “click-throughs” to your site. It is best to use your Web site Referral tracking as a benchmark and go to the source for their numbers when the Cost Per Click appears too high in comparison to your other Paid Listings. To be able to track the number of “click-throughs” provided from any Paid Listing site, you first must know who your Paid Listing Companies are so you may track them monthly. Organic Placement is the ranking your Web Site achieves in on the Search Engines at no cost. This is not placement determined by $$$, like PPC (Pay Per Click) but simply where the search engines place you at no cost. To determine your Organic / Natural placement in search engines such as GOOGLE, YAHOO, and BING you must first determine what Search Phrases that are actually being typed in or spoken by search engine users are most relevant to your business. If you have made your Web site Search Engine Friendly, once a month review your list of Search Phrases on the various search engines and record your placement. This information should be recorded separately from your tracking system. Remember to be logged out of your Google Account and to clear your Cookies before you test your placement. Otherwise Search Engine Personalization will skew your results. Refer to Educational Byte (.009) on how to delete your cookies. Most Web Site Trackers track the Search Terms or Search Phrases that the public is ACTUALLY USING TO FIND YOUR WEB SITE. In most cases, these phrases will match back to those phrases that were coded in your Titles, Descriptions, and Keywords if you had your site updated to be Search Engine Friendly. These phrases should tie back to the Entry Pages that contain these phrases. This is used as an indicator to see if organic improvements can be made to your site based on your Titles, Descriptions, and Keywords. In other words, are the phrases you have chosen as part of the Search Engine Friendly process really producing the results anticipated? Link Counts provide information on the Link Popularity that supports your organic listings. Once a Web site has been made Search Engine Friendly with the appropriate Titles, Descriptions, and Keywords, it is the link popularity (along with other various factors) as defined by the search engines that determines your placement in the organic listings. We recommend tracking your link popularity once a month for increase or decrease and the value of any new incoming links. Open Site Explorer is an online tool that you may use to assist in tracking your link popularity. Entrance Pages are simply pages from your Web site. If you have marketed each page of your Web site differently, each page has a chance to stand alone as a listing in the Search Engines. By examining your Entrance Pages monthly, you can prove that the work done to market all of your pages is effective. Guests don’t always see your home page first – especially if you designed and marketed all of the pages of your site to be different. In other words, the more pages you have indexed on the Internet with different Search Terms (phrases), the more chance you have to be seen. By watching your entry pages you will know which pages are working the hardest for you. PPC Listings should be tracked and recorded per month. You will need your access information for each PPC program you are participating in so you may log in and gather the information. You should track the number of PPC visitors for the month and the Total cost paid for those visitors. You may also choose to track which phrases you are paying for that bring you the most visitors. A few examples of PPC Programs are Google Ad Words and Microsoft adCenter (Bing Ads). Local Business Listings are found in a variety of the different search engines. They are usually accompanied by a MAP, and drive traffic to your business or Web site from your location on that map. These listings are not to be confused with organic listings (below the map) or sponsored pay per click (PPC) listings sometimes found above and to the right of the map. As you work your way through this online tutorial, you will learn how to claim, verify and validate your listing information in a variety of sources on the web. Acorn Internet Services, Inc. has been teaching and encouraging our customers to participate and benefit from Local Listing results for years. Local listings have become even more important due to the popularity of mobile devices like phones and tablets. We will be addressing Google Places business listings in this and the following sections. A Google Places business listing may be found by your potential guests in one of two ways. To test this yourself, you may enter in CITY+STATE+PROPERTY TYPE (ex: New Orleans bed and breakfast) on eitherGoogle web search (1) or in Google Maps (2) search boxes. Either way will ultimately lead you to the individual detail page for any local listing simply by clicking on either “reviews” or “more info”. In the test below we did a search on “Asheville NC bed and breakfast” in both Google Web search and also Google maps. Do keep in mind that the results may vary slightly between the 2 different Google subdomains (www.google.com) vs. (maps.google.com). 1) The first section is the Basic Business Information Section. This section contains the Business Name, Address, Phone Number (local), Web site (NAP+W), etc. You will notice “Bed & Breakfast” under the review star rating – this is a category chosen by the owner. The reviews are the Google reviews. The description is added in the editing option in Google My Business. If you do not claim and verify your listing, Google can pull the information. 2) The second section is “Book a Room”. This information comes from OTA and GDS (Online Travel Agencies and Global Distribution Systems). Most independent properties will not display information in this section. 3) Next are the Reviews – these are all reviews submitted by Google users. 4) Next is “People also search for” section, which will show other properties that match the search query. 5) Finally, you will see more organic listings from Google. You must first determine if your listing has been VERIFIED. Always be aware of multiple listings that might show up for your one business. You should only have (1) one local listing per address. *If you have multiples, you need to claim all the listings, verify one and delete the others. If your listing is UN-CLAIMED you will need to follow the steps in the following section to claim your listing. You must have a Google Master Account to be able to claim and update your Google Places Business Information. Note: If you have an AdWords, GMail, Google Analytics Account, Blogger, etc. you already have a Google Master Account, so it is that login you will need to use to CLAIM or Update your Google Local Listing information. Acorn Customers: If you need help claiming your Google Places Business Listings, we are available to assist at normal consulting rates. You only want to have 1 (ONE) Master Google account. Setting up a second one when you already have one MAY cause issues with Google. Click here and try all your E-Mail possibilities before you set up a new account to make sure you don’t have one lurking out there you may have forgotten about. If you are SURE you don’t have a Google account you may sign up for one clicking here. Note: Once you’ve Claimed your local listings, you will be able to go back and edit the information at any time. You will do this by following Steps 1 and 2 and then clicking on the Local Business Center Icon in your Google Master Account. Click Here to Watch The Video on how to Locate your Master Google Account Access! Note: If the name of your business, the local phone number or the physical address has changed, it’s a good idea to do some investigation online before you claim your listing. Google uses “Trusted Partners” to validate the information you provide when you claim your listing, and if the information isn’t consistent, your placement in the Google Places Local Listings may be affected. Step 2: Click Sign In in upper right hand corner and enter your Google Master Account userid and pw. Step 6: You will now have the opportunity to verify the business, either by having a postcard sent to your business address, having a call from Google to your business phone, or possibly an immediate verification via Webmaster Tools. Step 7: Once you’ve started the verification process, you can now edit the Google My Business listing with all of your current information. Step 8: Now fill in or update all of your Basic Information, including your address. When you reach the address field, you can also fix your placement on the map if it isn’t correct. * Help Note 1: Use your legal business name. Don’t add words to your name for placement. Google could reject your listing if it doesn’t match your published legal name. * Help Note 2: Make sure you add all of your information as Google has it listed in their example areas (usually below each field). For example, when you key in your phone number, use parentheses around your area code rather than just hyphens. When keying in your web site URL, use http (example: https://acorn-is.com, rather than just www.acorn-is.com). Also, remember to use your localphone number as the primary number, and use the toll free as the alternate. Step 9: Choose your Categories. Try to confine your categories to Google’s pre-defined categories. For example, Bed & Breakfast is a pre-defined category. You can find pre-defined categories by starting to type in categories to see what will pop up. Try all sorts of categories, such as Wedding Venue, Spa, Resort, Lodge etc. You have up to 5 Categories that you may define. Step 10: Set your Hours of Operation. Step 11: Introduction – add a description of your property, making sure to include anything that sets you apart from other properties in your area. You can mention breakfast, specials and packages, and mention how close you are to well-known attractions. Step 16: Click DONE EDITING to submit your information. Once your account is verified, you ‘ll be able to log back into your Google Places Account and update information any time you like. Step 17: Now click “Manage Photos” at the top of the page and add business photos. Depending on what categories you chose in step 9, you will be asked for different sorts of photos, such as exterior, interior, food, rooms, etc. Add as many beautiful photos as you can to this spot, as well as your logo. Step 18: Make sure to update your business page with posts every few days. We at Acorn IS continually try to provide our customers with accurate step by step instructions, but please know that there may be times when what we have written no longer coincides with the topic of choice. Please always refer back to the actual product page of the topic in discussion to read the up to date information should you experience problems with the instructions provided by Acorn IS. Please make sure you have taken time to read GP-101 (Google Places – The Basics) before you move on to the information contained in this more advanced tutorial on Google Places Business Listings. You will need to make sure you understand what a Google Places Business Listing is, where they appear, and that you have claimed your listing properly before branching off into the more advanced concepts presented below. There are three (3) major areas that impact the placement of your Google My Business Listing (GMBL). They are listed in the blocks above. We will discuss each in detail in this tutorial. Give a good Description that points out the amenities of your business. Updating your listing with posts every few days. Things that are HARMFUL to your listing. There is some debate as to whether SEO (Search Engine Optimization) associated to Organic Placement plays any role in GMBL’s placement. Some say, absolutely not, others say there may be “some” relation between organic SEO and Local Placement.Either way, you will want your website to be up to date with the same information you provide on your Google My Business Listing. The most important thing to keep in mind when working with any suggestions provided in this Trusted Provider section is to make sure your Business Information (Name, address, city, state, zip, web address, local phone number, etc.) matches from provider to provider. It’s all about consistency! Don’t spell your address differently from site to site. Example: 2nd E Third Street vs. Second East 3rd St. vs. 2nd East 3rd Street, etc. Also, don’t change the way your name is listed from site to site either. Example: 1891 Lennox House B&B, The Lennox House Inn, Lennox House Bed and Breakfast. And remember, always use your Local Phone number as your primary number. Note: Typically, when a guest locates a property listing on a search engine site where they choose to leave a review, they will simply click the “review” button, log into either Google, Yahoo or Bing as required, and a pop-up box for them to type in will appear. Those reviews will then show up in the reviews section of the local listing. With more and more people using GPS in the car and on the phone, it is important for businesses to make sure they can be found. Below you will find several steps to make sure that you are listed with the providers from which GPS manufacturers get their information. 1 – Start by going to the Itouch Web site to identify your Lat / Long GPS coordinates. At this time, check to see if your location is correctly indicated. If your location is correct or not, continue on with the following steps to either verify or update the following GPS feeds (you’ll need your Lat / Long coordinates from this step to check these feeds). 2 – Many experts say that data for GPS devices may come from local 911 mapping so make sure you are registered as a business with your locality whether city or county. To locate the appropriate 911 Web site for your area do a search in Google with your City or County + State + 911. 3 – If you determine that your information is incorrect on USGA maps, you may contact United States Geological Survey at 1-888-275-8747 or submit a request at gnis_manager@usgs.gov. 4 – You will need to make sure you are registered and your information is correctly recorded with NAVTEQ Map Reporter. We have found that NAVTEQ Map Reporter does not support “bed and breakfast” as a category, so innkeepers will want to use the Hotel designation. 5 – TeleAtlas is a main provider for GPS manufacturers, so please click here verify your information on TeleAtlas. 6 – An unlikely source of GPS information is INFOUSA, which also updates GPS makers, so please verify your information by clicking hereon INFOUSA. Following these steps will assist you in ensuring that your information is stored correctly in the newest versions of GPS, as well as phone updated versions. Keep in mind that older GPS units will not have newer business information unless the GPS owner has taken the steps to update their unit. Apr 13, 2015 – Are you a Medalist in the Google Local Olympics? July 28, 2015 – Is Pigeon Pooping on Your Placement? Inn keeping requires a wide variety of skills in order to be successful. I speak from experience, as Mark and I opened, owned and operated our Bed and Breakfast for just shy of a decade. As an Innkeeper, you must excel at everything from cooking, cleaning, bookkeeping, laundry, landscaping, decorating, accounting, room design, people skills, time management, maintenance, repairs, plumbing, psychology, mediation, problem solving and yes, even technology, just to name a few. When you find that you simply cannot do a required task yourself, you must hire someone to do it for you. Those decisions are critical, especially when it comes to your Web Company, as they are the lifeline to your revenue stream. Knowing the right questions to ask is your first step in choosing the web design, marketing and hosting company or companies that best meet your objectives. And though we here at Acorn IS would love to be your first choice, we also realize that no one web company can be all things to all Innkeepers. That’s why we have developed this interactive video answer library to go along with the questions to ask worksheet. We encourage you to use this as a guideline when choosing a web company, but also to add in any additional questions you feel are specifically relevant to your Inn and your business. If you would like to have this information presented in Webinar format, at no charge, for your Local, State or Regional Group, please contact us for details. Click to Print the “How to Choose a Web Company” Worksheet!Click to Request a Completed Worksheet from Acorn IS! Step 1: Click on the link above to print the “How to Choose a Web Company” Worksheet. Step 2: Read through the questions. Make note of those that you do not clearly understand. Step 3: Find the Part/s below that match the sections in “How to Choose a Web Company” Worksheet. Step 4: Click to watch any of the videos for further clarification. Each question that you should be asking a potential Web Company has a short video explaining why the question is important to your business. Is a support line available for emergencies? Is the company dedicated to adhering to Google provided guidelines? Is the company committed to the ongoing Education of their clients? Is the company devoted to supporting the health of client’s Overall Web Presence? What Type of Website Design will you be purchasing? Will all Plug-ins used in the Website design be investigated for quality and Google performance by the Webmaster? Will you be provided a CMS: Content Management System? Will all pages on the Website Pass Google’s Mobile Friendly Test? Will all pages on the Website score in GREEN in Google’s Page Speed Insights Test? Will Local NAP+W+GEO Schema / Rich Snippet Code be included on all Website pages? Click here https://youtu.be/RTvh7pxx4pk to learn how to use Google's Mobile Friendly Testing Tool. Click here http://googlewebmastercentral.blogspot.com/2015/04/rolling-out-mobile-friendly-update.html to read more about Google's April 21, 2015 release regarding Mobile sites. Click here https://youtu.be/nY3Ros9Y4Ew to learn how to use Google's PageSpeed Testing Tool. Click here https://youtu.be/dMmiGDC_ENw to learn how to use Google's Schema Testing Tool. Will Google Analytics (GA) be installed? Will E-Commerce Tracking be installed? Will the Google Search Console be installed? Are Google Publisher Tags installed on the Home Page? Is a Blog included as part of the Website? Who will write the Website content, including quality search wording, for all Website pages? Who will write and install the On-Page SEO Titles and Descriptions for all Website pages? Is there an On-Page SEO Plug-in included? Click here http://static.googleusercontent.com/media/www.google.com/en//webmasters/docs/search-engine-optimization-starter-guide.pdf to view Google's Search Engine Optimization Starter Guide. Are Social Media Use Buttons included on all pages? Are Social Media Share Buttons included on all pages? Will Mobile driving directions be installed? Are you permitted to keep your current reservation system? Does the Webmaster provide and support existing E-Mail account transfers? Are Professional Photography Services available? Are Professional Logo Design Services available? Are Professional Videography Services available? Are Professional Print Services available? Are Google My Business (GMB) Support and Optimization Services available? Are Google Reviews and Reputation Management Services available? Are NAP+W (Name Address Phone Website) Review, Recovery and Support Services available? Are NAP+W (Name Address Phone Website) Change Evaluation and Support Services available? Are In-Bound Link Checking, Recovery and Support Services available? Who is responsible for your E-Mail Hosting? Will your E-Mail provider offer a Webmail interface? Will your E-Mail provider offer you the ability to sync your E-Mail, Calendars and Contacts to your mobile device(s)? Who is responsible for your Website Hosting? Who is responsible for your Website Backups? How often will your Website content be backed up? Does the Webmaster limit the number of Websites on the server for better response time? What is the expected Up-Time of the Webmaster’s Server(s)? Does your Webmaster provide / guarantee multiple Webservers and load balancing, which will reduce downtown and slow page load issues? Will your Website data be replicated “real time” to a backup data center in a different geographic location, in order to provide disaster recovery in case of a catastrophe at the main data center? Has the Webmaster’s Server(s) been blacklisted in the past 30 days? Has any Website built and hosted by the Webmaster been hacked in the past 60 days? If your Website is hacked, will the Webmaster take full responsibility to fix the hack? Does the Webmaster use Tools or an Experienced Server Technician to investigate and resolve hacking situations? Who retains the legal ownership of your Domain Name (DNR Registration)? Who pays the yearly registration fees for your Domain Name (DNR Registration)? Who retains the legal ownership of the completed Website design? Do you have the legal authority move the Website and all its functionality to a new hosting company of your choice? CMS and Plug-in Security and Maintenance Updates? Reservation Fees if Provided by Webmaster? OTA Fees if Provided by Webmaster? Professional Photography if provided by Webmaster? Ongoing Education if provided by Webmaster? Click here https://developers.google.com/speed/pagespeed/insights/ to learn how to use Google's PageSpeed Testing Tool. Click here https://developers.google.com/structured-data/testing-tool/ to learn how to use Google's Schema Testing Tool.